Built Area : 50,000 Sq. Ft.
Upside Down is new age Community center on the banks of Chicago river. It is a symbol of a new architecture that permeates beyond a building, into the street where it integrates into the city fabric and engages the users and becomes a catalyst for urban public life. The project aims is to physically bridge the two levels of the city while respecting the distinct atmospheres created by them and the history of their existence. It looks to utilize the existing conditions to offer unique programmatic experiences that cater to both the community and the city at large. Upside Down celebrates the history and tradition of the River as a constantly evolving body of water that re-imagines itself to suit the needs of the city - from supporting the industrial establishments in the past to its current role in creating better urban public spaces for the people and speculates on the next iteration of this evolution to create and support sustainable ecosystems. The Contoured Landscape which becomes an urban public park bridges the two levels while creating multiple access points and paths. 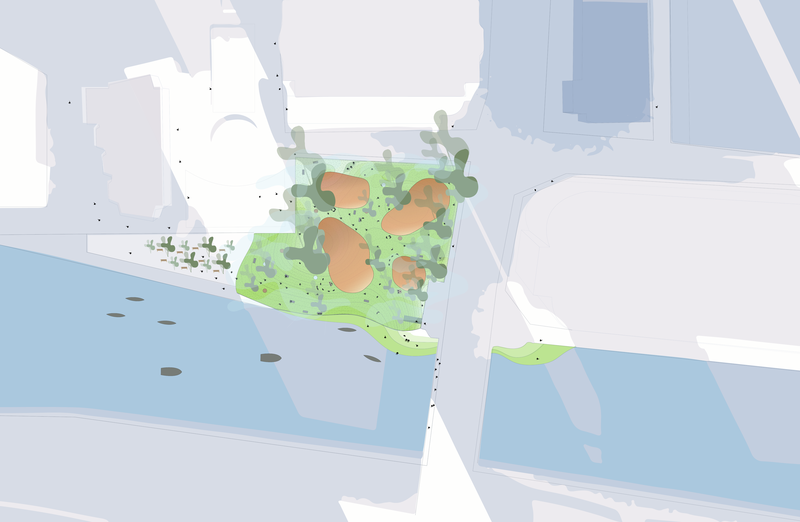 The landscape divides Upside Down into two halves : The urban park and the underbelly. The Underbelly, inspired by the industrial past of the city and the current usage of the lower level of Chicago, is an infrastructural level. The design takes advantage of the environment within this level and remixes it into an experiential space capable of supporting and enhancing multitude of experience driven programs. The landscape is punctuated by four volumes of programmed spaces - Admin, Commercial, Art and Auditorium; each housing different programs that are similar or interdependent on one another. These volumes are then wrapped with a phase-changing membrane that helps regulate the temperature within and also transforms the facade of these volumes into giant electronic displays. These volumes penetrate to the underbelly at different thresholds, while the commercial and art blocks occupy both levels with programs spilling out into the underbelly, the programs within the admin block only exist within the landscape half and auditorium only the underbelly. The entire landscape is supported by a grid of columns, with each column housing various systems that support Upside Down. Some of these columns also function as elevators connecting the Underbelly and the Contoured Landscape. The idea behind this project was to try and articulate the idea of a new architecture that breaks through the conventional boundaries of the profession i.e buildings and spills out into the streets of the city, where it engages with the users and slowly imbeds into the city fabric. The facade is functional and performative. The contours and terrain of the park allows people to activate it in numerous ways. The walls of underbelly help control the environment within the space allowing for curated experiences. Columns are multifaceted infrastructural elements within Upside Down. They link all the levels together. They also contain various systems that aid in temperature regulation and energy generation within the space. The park facilitates a seamless transition between streetlife and the river. The setting in Upside Down allows for interactive & experiential installations. A snapshot of life within the 'Commercial Block' showing library space above and a cafe on the ground level. A floor section within the 'Admin Block' showing the systems helping temperature regulation within the programmed spaces.